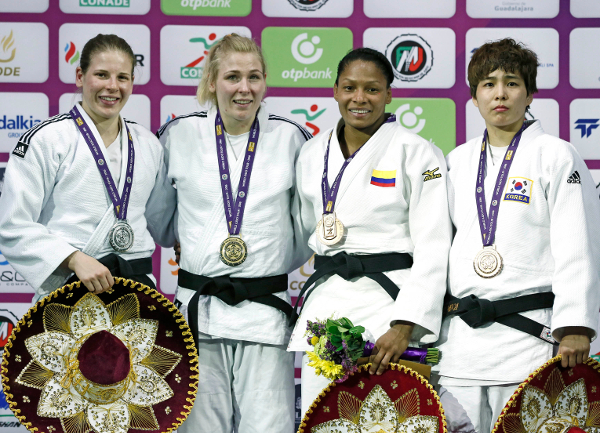 The World Judo Masters thrilled an animated crowd on day two as the four gold medals were shared by three countries at the Lopez Mateo Sports Centre on Saturday. Day two was a sensational affair as Olympic and world medallists reconfirmed their Rio 2016 credentials while there was everything to gain for judoka chasing a seeded position for the Games which is reserved for the top eight on the Olympic qualification list. 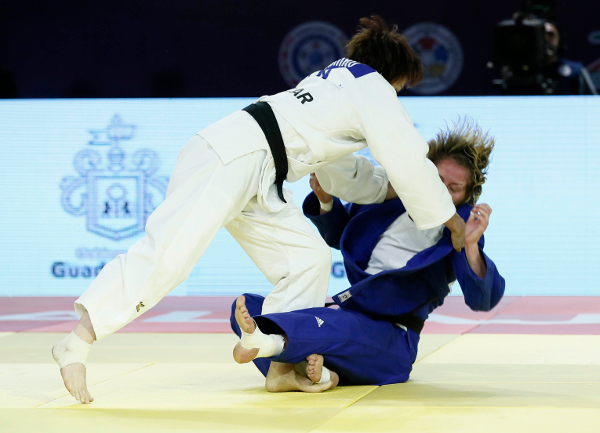 Four categories were engaged in action as the women’s -63kg and -70kg judoka shared the tatami with the men’s -73kg and -81kg categories in a day of raw emotion and pulse-pounding judo as many stars competed for the final time before the Olympics. Every judoka wanted a place on the podium at the invite-only World Judo Masters, to hear their anthem, to see their flag raised and to experience that winning feeling one last time before it matters the most at Rio 2016. IJF Hall of Famer and double Olympic champion Peter SEISENBACHER has been there and won it as a judoka and as a coach and is currently presiding over the Azerbaijan team who caught the eye on Friday and Saturday in Guadalajara. 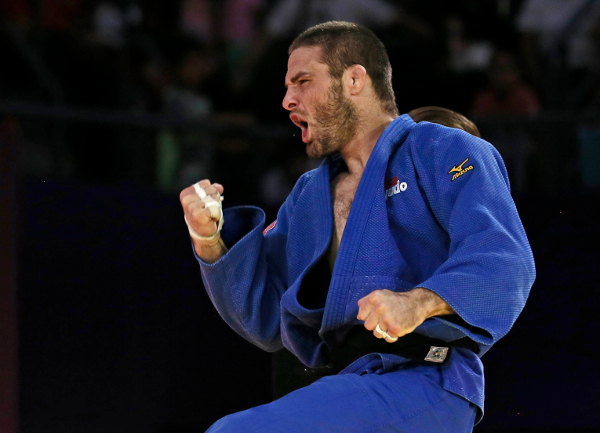 Austrian great SEISENBACHER, who was in the chair on Friday when Orkhan SAFAROV won -60kg gold and when Nijat SHIKHALIZADA gained -66kg bronze, stressed the importance of his team’s methodically planned preparation for the World Judo Masters. “We knew it was important to arrive early,” said the 1985 world champion. “We arrived here well in advance of the competition as I know that an athlete can hold two litres of water from a long-haul flight, which can cause problems with the weight of an athlete. You also have to take into consideration the elevation here, as we are 1598 metres above sea level. Click here to subscribe to our notification service – login with your Facebook account and you can receive notifications when your favourite judoka or country is competing. Double world bronze medallist TASHIRO Miku (JPN) retained her World Judo Masters title as she defeated Almaty Grand Prix bronze medallist Juul FRANSSEN (NED) in the -63kg final on day two. FRANSSEN, who was still very much in contention for Rio 2016, started with an ouchi-gari attempt and that was the best of her opportunities as TASHIRO was still prodding despite being largely contained by her Dutch opponent. TASHIRO prepared for her first Olympics in the ideal fashion by scoring a waza-ari from a beautiful piece of ashi-waza and saw out the remaining time for gold. The first bronze medal was won by Asian Championships bronze medallist YANG Junxia (CHN) who showed her character to come from behind to beat European Championships silver medallist Kathrin UNTERWURZACHER (AUT). YANG fell behind to a waza-ari from a sasae-tsurikomi-ashi as UNTERWURZACHER began to apply pressure. However, it was YANG who ended up in control on the ground as she held down her rival for 20 seconds and ippon with a mune-gatame hold. The second bronze medal was claimed by European Championships bronze medallist Anicka VAN EMDEN (NED) who defeated Almaty Grand Prix silver medallist TSEND-AYUSH Tserennadmid (MGL) on shido penalties. TSEND-AYUSH fought to apply a koshi-jime strangle but VAN EMDEN held firm and went on to prevail by shido penalties in a scoreless contest with three shidos against the Asian fighter and only one against the Dutch star who is expected to receive the nod for Rio 2016. The Netherlands can only send one fighter in the -63kg category and have to choose between VAN EMDEN and FRANSSEN as both are well-placed in the qualification zone. 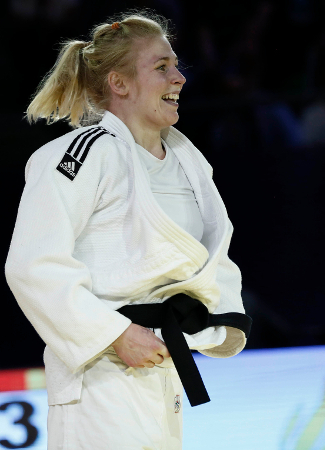 World number one Kim POLLING (NED) left no doubt that she is the favourite for the -70kg title at Rio 2016 by besting a game Dusseldorf Grand Prix winner Bernadette GRAF (AUT) in the -70kg final. POLLING has experienced her share of highs and lows in this cycle with some indifferent results at times but the classy Dutch fighter proved herself at the most important competition before the Games with a convincing performance in Mexico. GRAF, who also started and ended the day in a seeded position, went behind to a yuko and was then trapped in osaekomi by a kami-shiho-gatame and a sapped GRAF had to submit after 12 seconds as the runaway world leader moved out of sight with an additional 700 points. 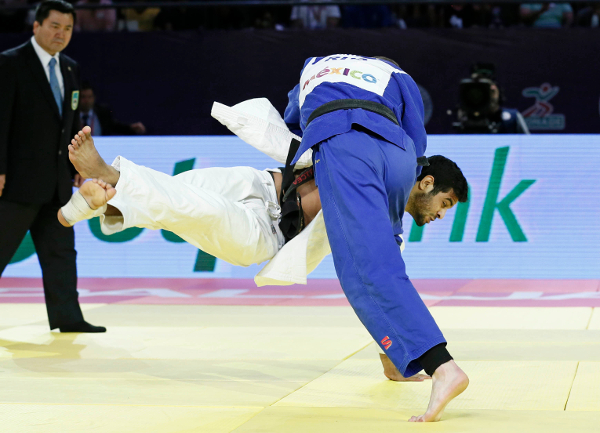 The first bronze medal was claimed by triple world champion and Olympic bronze medallist Yuri ALVEAR (COL) who saw off Almaty Grand Prix silver medallist TSEND AYUSH Naranjargal (MGL). World number three ALVEAR, who is arguably her country’s best chance of Olympic success in Rio, threw world number 17 TSEND AYUSH with her favoured osoto-gari as she put her right arm over the top of the Mongolian and surged forward for a booming ippon which was applauded by the home crowd. 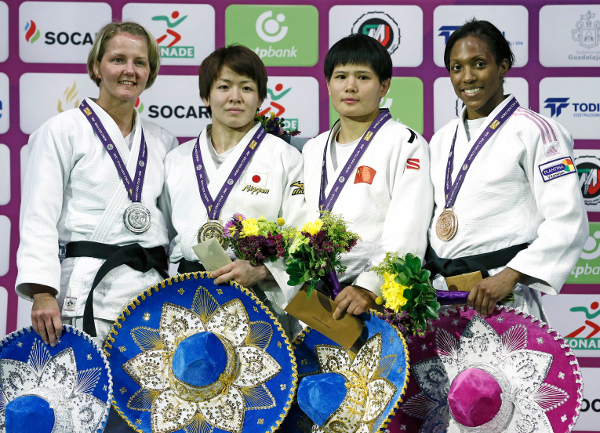 The second bronze medal contest was won by Asian Championships silver medallist KIM Seongyeon (KOR) who came on strong in the latter half of the contest to defeat Paris Grand Slam bronze medallist Sally CONWAY (GBR). CONWAY worked hard for a ne-waza opening and the British fighter was in the ascendancy for the opening minute but KIM grew in confidence and was able to catch the Bristol-born judoka with a ura-nage for a waza-ari and that settled the contest after five minutes. The result confirms KIM as a seeded fighter for the Games while CONWAY will leave bitterly disappointed but will refocus when she arrives home and the lifelong goal of an Olympic medal is still very much a possibility in August. 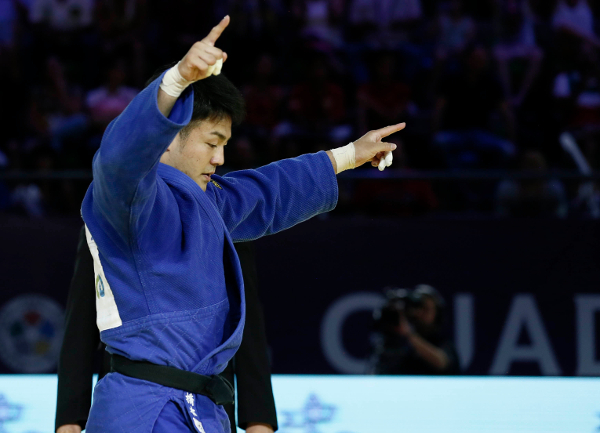 Asian Championships winner HASHIMOTO Soichi (JPN) claimed World Judo Masters gold at the first time of asking as the 24-year-old won the second IJF gold medal of his career which is starting to take off and will surely flourish after the Games. World champion ONO Shohei (JPN) is the chosen one for the Olympics and the Japanese selectors clearly hold HASHIMOTO in high regard to enter him into such a top-class event. 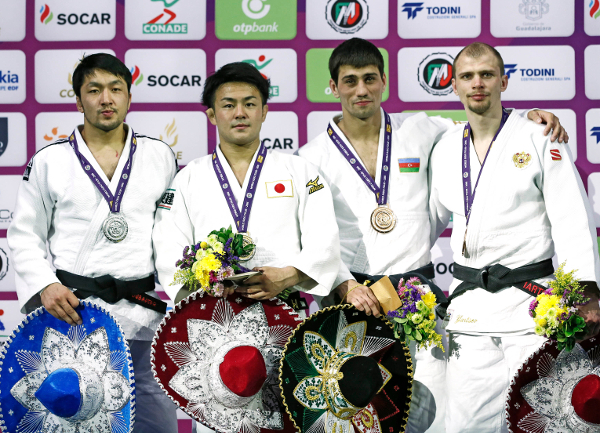 Their belief was rewarded as HASHIMOTO, who is the same age as ONO, explosively defeated Tbilisi Grand Prix silver medallist GANBAATAR Odbayar (MGL) with a juji-gatame in the final. HASHIMOTO was as dangerous and effective in tachi-waza as he was in ne-waza and looks set to rival ONO in the weight category after the Olympics. The first bronze medal was won by European champion Rustam ORUJOV (AZE) as world bronze medallist AN Changrim (KOR) was unable to compete due to a right shoulder sprain which he suffered in his previous contest. ORUJOV came into the competition with an ankle injury but was desperate to fight and SEISENBACHER said they would take it fight-by-fight and that decision was vindicated with a bronze medal which sealed the Azeri’s spot as one of the top seeds at Rio 2016. The second bronze medal was won by Paris Grand Slam runner-up Denis IARTCEV (RUS) who wasted no time in securing his place on the podium as he forced his way past European Games winner Sagi MUKI (ISR) by ippon after 98 seconds which he will expect to have been enough to be selected by Russian team manager Ezio Gamba for the Olympics as the Italian has a host of Russian judoka to pick from. Pan American Championships silver medallist Travis STEVENS (USA) won the most important gold medal of his career as he accomplished exactly what he hoped which was top spot in Mexico and with it a seeded position for the Olympics. STEVENS, 30, who was seen by many as one of the best judoka to leave London 2012 empty-handed, found himself in a toe-to-toe clash against Samsun Grand Prix bronze medallist Joachim BOTTIEAU (BEL) in the -81kg final. BOTTIEAU was penalised for not taking a grip before STEVENS was penalised for a false attack. The Belgian was running the risk of prematurely being stopped as he was penalised for passivity and pushing his opponent out which gave him three shidos. BOTTIEAU had a tomoe-nage transition into a juji-gatame from STEVENS scouted but was caught with a sumi-gaeshi with 17 seconds left for a yuko and tapped out after nine seconds in osaekomi. The first bronze medal was won by Tbilisi Grand Prix bronze medallist Roman MOUSTOPOULOS (GRE) who dismissed former Baku Grand Slam winner Alan KHUBETSOV (RUS). 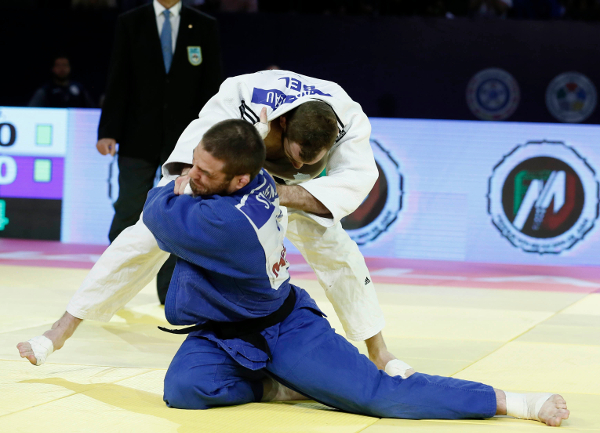 Both judoka looked to attack with uchi-mata but were unable to break each other’s balance and the contest was decided on shido penalties as an out-of-sorts KHUBETSOV tired rapidly and was penalised twice while MOUSTOPOULOS looked the fresher of the two and escaped the contest without a shido. 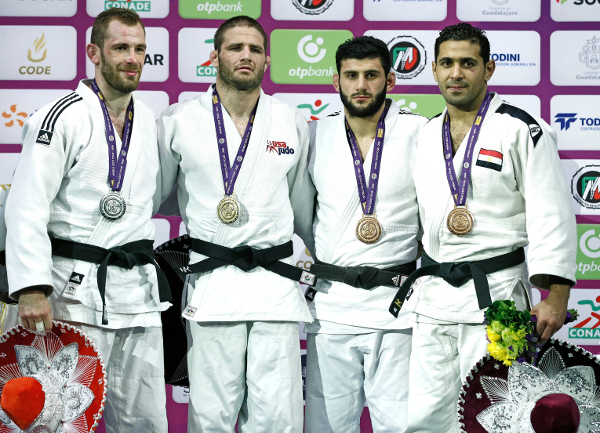 The second bronze medal was won by African Championships winner Mohamed ABDELAAL (EGY) who found another level in golden score to extinguish the hopes of Almaty Grand Prix bronze medallist NYAMSUREN Dagvasuren (MGL). The Mongolian tried to set up his drop morote-seoi-nage but ABDELAAL was ready for the attack and then started to ask questions of his opponent as the five minutes of regulation time ended with no scores and a single shido apiece. ABDELAAL was more active and that was acknowledged by the previously impartial crowd who were now in the corner of the Egyptian and he excited them even more when he threw with a rotating ouchi-gari after 43 seconds for ippon and the African fighter will not be overlooked by any opponent at the Olympic Games.